DOUGLAS COUNTY, Colo. — In a choked-up voice, Colorado State Patrol Trooper Matthew Normandin recalled the moments he saw his colleague, CSP Trooper Cody Donahue, struck and killed by a truck along Interstate 25. Normandin testified Wednesday morning during opening arguments in the trial for the man accused of hitting and killing Donahue just south of Castle Rock near Plum Creek Parkway on Nov. 25, 2016. This is the second time the case has gone to trial: A Douglas County judge last September declared a mistrial in the case against Gamez-Ruiz. A jury on Tuesday was seated for the trial. The defendant, Noe Gamez-Ruiz (pictured below), pleaded not guilty to criminally-negligent homicide and two traffic offenses: one for careless driving and another for careless driving resulting in death. Donahue, an 11-year CSP veteran, was out of his patrol car assisting Normandin with investigating another crash that day when he was hit and instantly killed by a truck. Normandin, a 10-year CSP veteran, was the lead investigator on the crash. According to court testimony, Donahue showed up about 10-15 minutes later, and both men parked their patrol cars completely in the right shoulder while investigating the single-car crash. Normandin testified in court that he was inside his patrol vehicle when Donahue was struck. He said he saw it happen, and that he jumped out his car and immediately called over the radio, "Officer down, officer down!" Normandin said he ran up to Donahue and could clearly see that he was dead and that he "stood there in shock" after it happened. 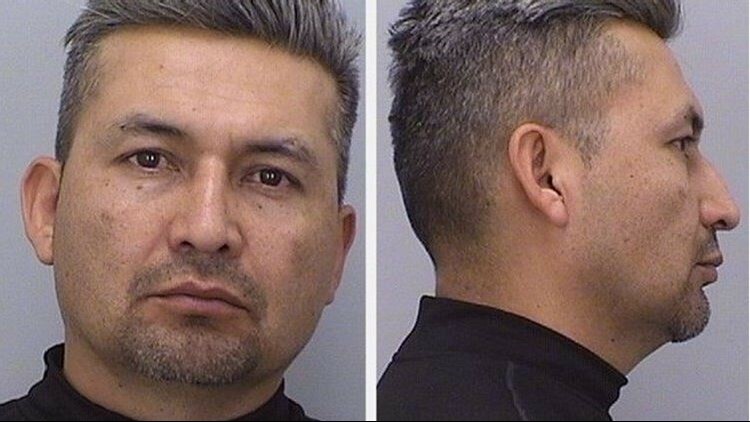 Arapahoe County Deputy District Attorney Thomas Byrnes said in opening statements that Gamez-Ruiz had "plenty of opportunity" on the "clear and open road to move over." "The defendant had the knowledge, training and experience to avoid killing trooper Donahue that day," Byrnes said. Defense Attorney Steve Burstein said the case was a "tragic accident." "It is an accident and nothing more and nothing less," Burstein said. Byrnes said Gamez-Ruiz was driving 54 mph as he crossed over the white line and passed two marked patrol vehicles with flashing lights. Gamez-Ruiz could have seen the flashing lights from over 1.5 miles away, which would have given him 1 minute, 45 seconds to move over a lane, according to Byrnes. Dash-cam footage and footage from inside Gamez-Ruiz's U.S. Foods truck was displayed in court and showed the moment Donahue was struck. According to court testimony, Donahue was struck by three different parts of the box truck. It's believed a lock on the back of the vehicle struck the trooper in the head, delivering the fatal blow. Douglas County Sheriff's Deputy Leonard Herstein testified that he responded to the initial crash after Donahue was struck. Gamez-Ruiz is heard on camera saying he was driving in the right lane, saw the police cars ahead, but couldn't move over. He said in the video that he then saw a yellow vest in his rear-view mirror as he passed. He said he then swerved and hit the guardrail and came to a stop in the right shoulder. Testimony continues throughout Wednesday, and the trial is expected to last eight days. Last September, a judge declared a mistrial in the case after two pieces of evidence came out that the defense says they should have seen. Following Trooper Donahue's death, Colorado passed the "Move Over for Cody Act." The law stiffens penalties for drivers who fail to move over for emergency vehicles and cause injury accidents. Under the law, a driver who failed to move over and injured another person would be charged with a class 1 misdemeanor. A driver who causes the death of another person would face a class 6 felony charge. Morrison Police Chief George Mumma told 9NEWS on Tuesday his officers routinely deal with drivers who fail to move over. Mumma described a Jan. 23 incident in which a driver of a truck crashed into an officer's car as he was working a crash on C-470. Thankfully, the officer and driver he was helping were outside of their cars at the time of the crash. "Had that car moved over like the law says, then this accident would never have happened," Mumma said. The driver was cited, and Mumma is thankful his officer wasn't hurt. He hopes drivers start changing their habits. This story draws on previous reporting from Katie Eastman and Allison Sylte.